This layer adds support for Assembly code. 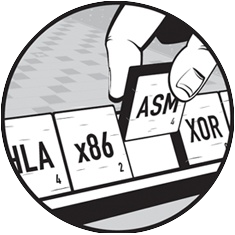 The built-in major mode for editing assembly code in Emacs is asm-mode. The layer also adds nasm-mode for NASM-specific syntax. Although nasm-mode is intended for NASM, it actually works well with other variants of Assembly in general, and provides Imenu integration so you can jump around with SPC s j.
Auto-completion for symbol in opened buffers. Look up documentation for current instruction at cursor. To use this configuration layer, add it to your ~/.spacemacs. You will need to add asm to the existing dotspacemacs-configuration-layers list in this file. Intel® 64 and IA-32 Architectures Software Developer Manuals. Any PDF that contains the full instruction set reference will work, though volume 2 is the best choice for x86-lookup. The first time you launch the command, it can take a while for indexing, this is a one time operation and the result is cached for later use. Convert an empty comment to a `larger' kind, or start a new one.